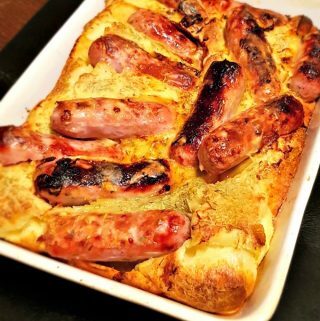 This is a very simple toad in the hole recipe that is pure family comfort food! With a light batter and at just 45p a serving, it’ll make your bank balance happy too. It’s toad in the hole. But who cares when it’s so good! It’s just a simple recipe of sausages baked in a Yorkshire pudding batter. Toad in the hole is pure comfort food, perfect for a cold winter’s evening, especially when you cover it in gravy. It’s easy for the whole family to enjoy! As you’re using basic store cupboard ingredients, this toad in the hole recipe is also super cheap. It’s an excellent family meal if you’re cooking on a budget. How do you stop toad in the hole sticking? Washing up after dinner is my least favourite time of the day. It’s even worse when you’ve got baked-on food that just won’t budge. 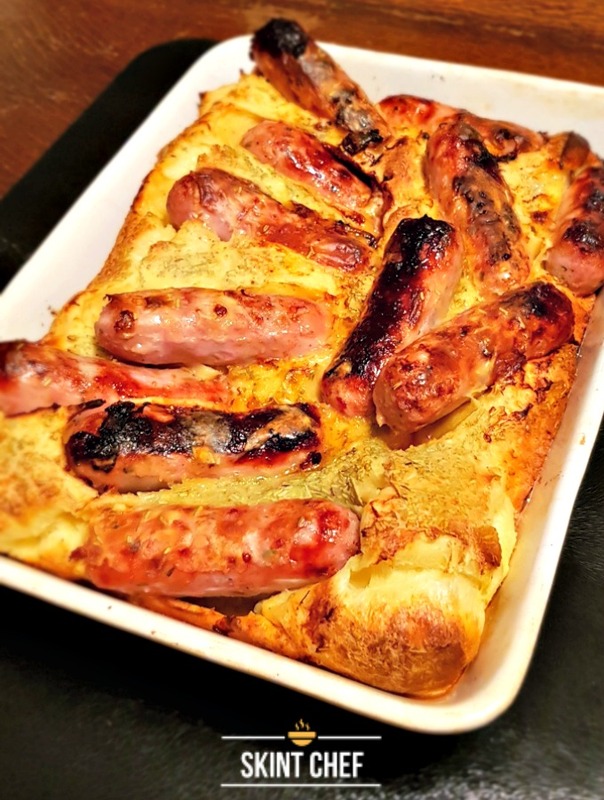 But before you even worry about cleaning it off, trying to serve up a traditional toad in the hole, without the batter sticking to the bottom or the sides, can be a nightmare if you don’t get the recipe right. You don’t need to worry about greasing the dish though. Making sure your toad in the hole doesn’t stick is all about getting the heat right (just like making the perfect Yorkshire puddings). You need to get the oil in your dish smoking hot. Don’t use olive oil; you want to use a cheaper sunflower oil that smokes when heated. This means when the batter goes into the dish, it will already start to cook before it reaches the oven. Also, once it’s finished cooking, remove your toad in the hold from the oven and leave for a few minutes to cool down before you start cutting it into portions. How do you make toad in the hole? First up, you need to get your oven hot, and you can start cooking your sausages. 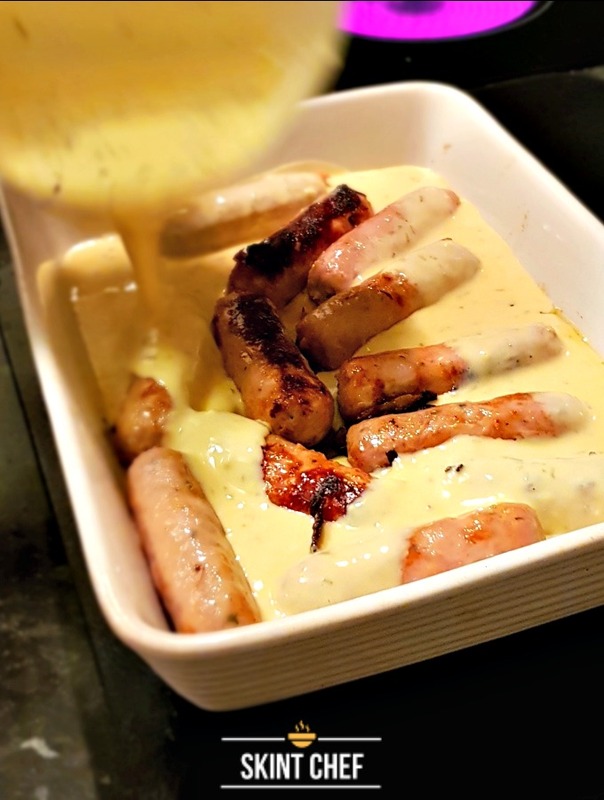 Cooking them in an oven-proof ceramic dish, like this one on Amazon, allows the fat to release from the sausages naturally. The fat from the sausages gives a base of fat to cook the Yorkshire pudding batter. It also means you don’t need a separate frying pan to wash up. Essentially, you’re just looking to brown the sausages and get the oil really hot. While this is happening, you can prepare the batter. This also allows the batter to rest for a few minutes before you use it. Letting a batter rest before you cook them means you’ll have a better texture and it will rise well. You may think it’s just one of those dinners you can eat as a family but it’s easy to make it into a show stopper. If you’re having friends round, but you’ve got a tight budget, look to cook the toad in the hole in individual ceramic post. Just divide the sausages into each of the mini ovenproof dishes, like these ones on Amazon, and cook as usual, then add the batter in and cook again. The smaller, individual toad in the holes will look amazing. What do you serve toad in the hole with? Toad in the hole is best served with creamy mash potato. To mix things up, try adding a sweet potato when boiling your potatoes. Boil or steam your favourite veggies and don’t forget lots of gorgeous beef gravy! 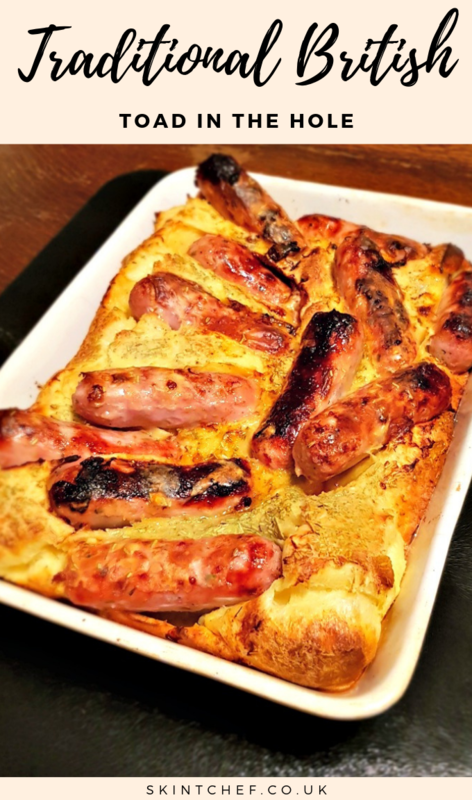 This is a very simple toad in the hole recipe that is pure family comfort food! With a light batter and at just 45p a serving it'll make your bank balance happy too. Place the sausages into an oven proof dish with the sliced onion and cook in the oven for 20 minutes. In the meantime, make the batter mix by sieving the flour into to a bowl then add the eggs, salt and mix the milk in slowly. Once all the milk is added, whisk the batter until smooth. Remove the dish from the oven and pour the batter mix around the sausages. Cook for approximately 40 minutes until the Yorkshire batter is golden and crisp.